In part 2 of our Premiere Pro tutorial focusing on the Audio Track Mixer, I continue with Automation Modes, which I began discussing in the previous article. So what do these modes do? Read: Reads any channel animation you may have created and plays it back. This is the default setting. 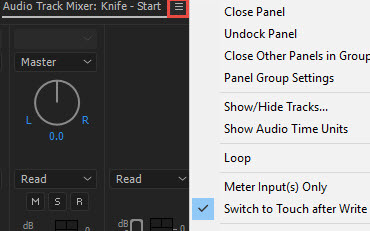 Off: Ignores any animation you may have recorded, and just plays the channel back, and pans the channel to the present settings of the channel fader and pan knob. Latch: When you push the spacebar to play back your timeline, no keyframes are created until you make a change. At that point new keyframes are created, and the fader will stay at the place you leave it when you let go of the mouse. 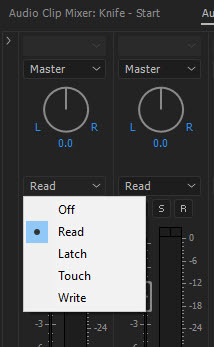 Touch: This is like the option I described in the Premiere Pro Audio Clip Mixer tutorials (click here and here to read them). On playback, no keyframe is created until you make a change, but once you move the fader, keyframes are created. However, unlike Latch mode, once you let go of the fader it will return back to the level it started at. The default setting is 1 second to return, but this can be changed in your preferences. Write: DANGER WILL ROBINSON –DANGER – this mode will create keyframes as soon as you click play, and write over everything you have done, at whatever level the fader is set or moved to. Use with care. Note: Because write is a dangerous mode, there is a default option in the panel menu that switches ‘Write’ to ‘Touch,’ once you stop recording. You can turn this off if you like living on the edge! 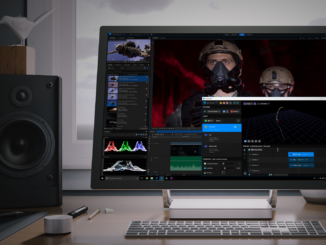 Click here for more Premiere Pro Tutorials.